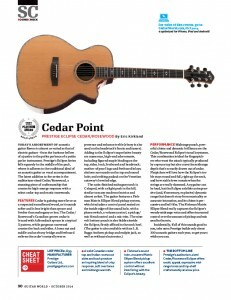 Cedar Point - Eclipse Cedar/Rosewood Guitar World Review - Prestige Guitars Ltd.
TODAY’S ASSORTMENT OF acoustic guitar flavors is almost as varied as that of electric guitars—from the baritone bellow of a jumbo to the polite parlance of a petite parlor instrument. Prestige’s Eclipse Series falls squarely in the middle of the pack, where it adheres to the traditional ideal of an acoustic guitar as vocal accompaniment. The latest addition to the series is the auditorium-sized Cedar/Rosewood, a stunning piece of craftsmanship that creates its high-energy response with a select cedar top and exotic tonewoods. Cedar is gaining more favor as a respected soundboard wood, as it sounds softer and is less bright than spruce and livelier than mahogany or koa. The Cedar/ Rosewood’s Canadian-grown cedar is braced with Adirondack spruce in a typical X pattern, while gorgeous rosewood creates the back and sides. A bone nut and saddle and an ebony bridge and fretboard enliven the cedar’s naturally warm presence and enhance treble (ebony is also used on the headstock’s fascia and tuners). Adding to the Eclipse’s superlative beauty are numerous, high-end adornments, including figured maple binding on the top, sides, back, fretboard and headstock; mother-of pearl logo and fretboard inlays; abalone surrounds on the top and sound hole; and striking padauk on the Venetian cutaway’s beveled edge. Midrange punch, powerful chime and dynamic brilliance are the Cedar/Rosewood Eclipse’s tonal keystones. This combination is ideal for fingerpickers who want the attack typically produced by a spruce top but also crave the midrange depth that’s so easily drawn out of cedar. Flatpickers will love how the Eclipse’s treble stays round and full, right up the neck, and how stable lows remain when the strings are really slammed. Any guitar can be loud, but the Eclipse exhibits an impressive (and, if necessary, explosive) dynamic range that doesn’t stray from musicality or accurate intonation, and its chime is percussive and bell-like. The Fishman Matrix Ellipse Blend really captures the Eclipse’s woody midrange voice and offers increased control over the amount of pickup and mic used in the mix.